These days, we don’t get a lot of good news about democracy. All over the world, power is being taken away from the people, politicians openly question the value of democracy and totalitarian regimes no longer even try to hide their human rights abuses. Oddly enough at the same time, democracy at the local level is booming (or maybe that’s not so odd). This month, I attended the Democracy Week in the small town of Falun in Sweden. People from across the globe came to present what they’re doing in their own corners of the world, and it was amazing! As if through some sort of fluke in the space-time continuum, from Falun I could see ancient Athens, where citizens debated their issues in public squares. Maybe the answer to our problem today is simple: let’s talk to each other about the problems we see and let’s try to change our communities for the better. This is also the goal of our new project, European Public Sphere: to get us talking again. The project is setting out on a Europe-tour to debate the future of the EU. The European Public Sphere will set up shop in public spaces where anyone can join the discussions. More on that here. Finally, we're proud to present to you our brand new “global newsletter” in cooperation with Swissinfo and people2power. From now on, we’ll bring you stories of participatory democracy and active citizenship from across the world, not only in English, but also in German and French. New in the Democracy International team and excited to see so many inspiring initiatives. We should be skeptical of global rules and principle, even of “international” democracy. The way forward is local, writes Joe Mathews from South Pasadena. On 13 September, Sweden marked the National Citizens’ Initiative Day with the release of a national platform for citizens’ initiatives: Folkinitiative.se. We spoke to Thomas Larsson, the project leader. Animal welfare and modern direct democracy are like twins. Together they are able to unify people in a way many other issues aren’t. A year after the nationwide vote, hardly anyone is talking about the controversial topic of unconditional basic income for all in Switzerland. Not so in other parts of the world. On September 24th, Swiss voters could vote to reform the country’s old age pension scheme. It is an important, but only temporary decision and illustrates that modern direct democracy comes at a price. As a citizen of your municipality, region and country, you may be entitled to make your own proposals and decissions on subsantive issues. 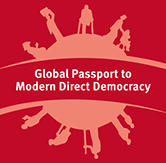 The new Global Passport offers basic information and handy recommendations on tools of modern direct democracy.